What is Clicker Dog Training? Lynn provides clicker training classes in the Imperial Beach or San Diego county area and is a full member of APDT (Association of Pet Dog Trainers). Clicker training is a style of training based on the work of B. F. Skinner, Bob and Marian Bailey, and Karen Pryor. Karen Pryor coined the phrase ‘clicker training’ when she was working with dolphins in the 60s (as chronicled in her excellent book, Lads Before the Wind). In clicker training a sound, usually a clicker, is used to mark a desired event. Thus the sound of the clicker is called an ‘event marker’. The click is always followed by a treat, so that the animal associates the event with something rewarding. (This is a form of Operant Conditioning.) Research has shown that rewarded (reinforced) behaviors are likely to increase. A classic example is that of teaching the sit. Each time the dog sits he gets a click, followed by a treat. The dog will sit more and more often. 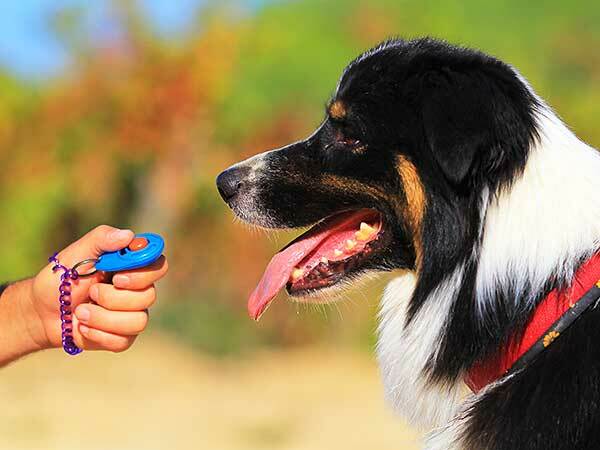 Clicker dog training is an ideal way to communicate with your dog. A partnership is created between you and your dog based on love and respect. The click is a neutral tone (neither cheerful nor angry, unlike the human voice), and will only be associated with good things. The click can instantly communicate to the dog that it has done something desirable. Clicker dog training is a proven method that uses positive reinforcement that can help you train your Aussie. These are terms used in Operant Conditioning. Reinforcement and Punishment can be divided into four categories. It is imperative to remember that + and – are mathematical terms, not moral judgments! Positive reinforcement (R+): This is where something is added in order to increase a behavior. Ex: you give your dog a treat to reinforce the sit. Negative punishment (P-): Something is removed to decrease a behavior. Ex: walking away when your dog jumps up on you, thus removing the attention he desires. This is far more desirable than positive punishment, but still must be used carefully. Extinction: Weakening a behavior by not reinforcing it. Instead of petting your dog when he jumps on you, you walk away (P-). Eventually the dog will stop jumping on you (extinction). i-Click Clicker — Revolutionary in design and function the new i-Click was designed by the clicker trainers at Karen Pryor Clicker Training to provide the next generation tool for clicker training. The easiest way to do this is to just start clicking. With the clicker in your hand, put your hand in a pocket or behind your back. This way the sound shouldn’t startle the dog. Click, and give your dog a delicious, pea sized treat. Keep doing this, moving your clicker hand to different positions. (This way the dog doesn’t just associate rewards with the sound coming from a particular location.) After about 15-20 clicks (it varies from dog to dog), the dog will perk up when it hears the click, and start looking around for the treat. Hooray! The dog has now made the association. If your dog is afraid of the sound of the clicker you can soften the tone by putting layers of tape across the dimple on the clicker. Gradually remove the tape, one layer at a time, so the dog can adjust to the tone. NOTE: Remember to praise your dog! Clicking and treating (C/T) doesn’t mean we refrain from verbal praise. If your dog isn’t interested in the treats there could be several reasons. Your dog isn’t hungry. Schedule your training sessions a few hours before or after mealtime, when the stomach is empty. Your treats aren’t appealing. Be sure you’re using a treat the dog likes. Different dogs are motivated by different foods. Try Cheerios, hot dogs, diced meat, diced cheese, a premium kibble other than his usual food, premium cat food (as an occasional treat), anything that excites your dog! If your dog is too enthusiastic about taking treats from your hand, don’t despair. With young dogs, say ‘yikes’ or ‘ouch’, in a high pitched tone (so you sound like a puppy), and then pull your hand away. Then go away for a minute or so. Another trick is to make a fist around the treat. As long as the dog chews at your hand, it doesn’t get the treat. Once it stops and backs up, open your hand and let the dog have the treat. If your dog is a real shark, you can wear a glove during the process. Lastly, try giving the treats from a metal spoon. Dogs don’t like the feeling of biting metal. With each treat, move your hand closer to the bowl of the spoon, until your fingers are on the bowl. Then switch to using your hand. For clicker dog training classes in Imperial Beach or San Diego county area contact Lynn Whinery at Bonza Canine Education.